Day 5 of Camp Create at the My Favorite Things blog is about "Glitzy Glitter." I don't use glitter often, but decided to create this glitter die cut inlay card for this challenge. I die cut the greeting from MFT's "Happy Hellos" set (apparently discontinued) in a panel of dark blue cardstock. I also cut a scrap of white cardstock, applied Scor Tape to the front, and die cut the hello again. For that, I adjusted the pressure setting on my die cutting machine, so it only cut through the liner paper on the adhesive layer. I removed the liner paper from around the word, and adhered that piece to the back of my blue panel, being careful to line up the letters. After choosing 6 colors of glitter (in rainbow order), I removed the liner paper from just the "h" and applied first red glitter, then orange. After burnishing the glitter into the adhesive & wiping away the excess with a tack cloth, I moved on to the rest of the letters. I removed the liner paper from one letter at a time, and applied the glitter. I had made sure, before I starting glittering, to adhere the centers of the "e" & "o" that had been cut from the blue panel. After I had applied all the glitter, I gave one final burnish. For the arrows, I used a die from "Blueprints 13." I die cut the first arrow from a piece of red patterned paper (all the papers were from my scrap stash). For the remaining arrows, I did only partial die cutting, letting the end of the arrow hang off the edge of my cutting platform. After I'd finished with the die cutting, I determined how long to make the arrows from orange on, and finished the cut on each with my craft knife. Then I adhered them in place on my panel. All that was left then was to mount the card front to a white A2 card base. I will send this to Send a Smile 4 Kids, to cheer up a hospitalized child. I'm also entering my card in Incy Wincy Designs "Sparkle & Shine" challenge. What a fun idea!! Love those arrows!! 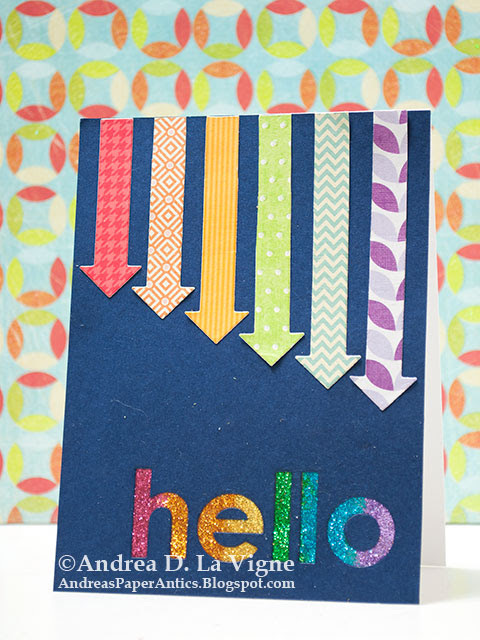 Thanks for joining our ‘sparkle or shine” challenge over at Incy Wincy Designs Challenge Blog! I love to hear your thoughts on my work, so feel free to speak your mind! All content on this blog is ©2014-2017 Andrea D. La Vigne. No content may be used without the express written permission of the copyright holder.